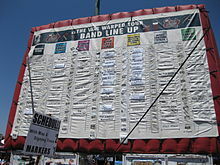 The Vans Warped Tour is a traveling rock tour that toura the United States (including 3 or 4 stops in Canada) annually each summer since 1995. It is the largest traveling music festival in the United States, and is the longest-running touring music festival in North America. 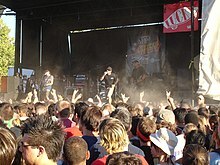 The first Warped Tour took place in 1995, and the skateboard shoe manufacturer Vans became the main sponsor of the tour starting with the second tour in 1996, when it became known as the "The Vans Warped Tour". 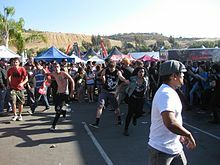 Although Vans continued to be the main sponsor and lended its name to the festival, other sponsors also participated with stages or other aspects of the festival sometimes being named after them. This page was last edited on 21 April 2019, at 02:46 (UTC).